My last post ends with me fixing myself a bowl of corn flakes and figuring out our plan for the day. The weather is cold wind and rain. I don’t feel like going outside or going anywhere on such a dark, damp day. I climb in bed with a book. Bridget and Spike soon realize there’s not much point in going out and content themselves with several long naps. 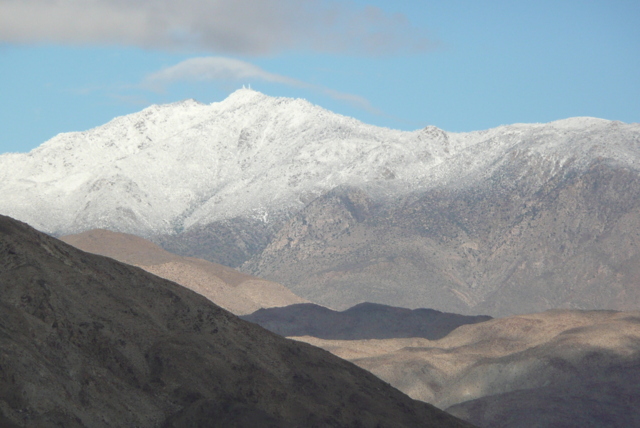 First thing I notice this morning is the snow on the highest peaks in view from our campsite near Clark Dry Lake in the Anza Borrego Desert. Today is a day to get things done. Even though a cold wind blows, I have to take action. It’s time to dump tanks. 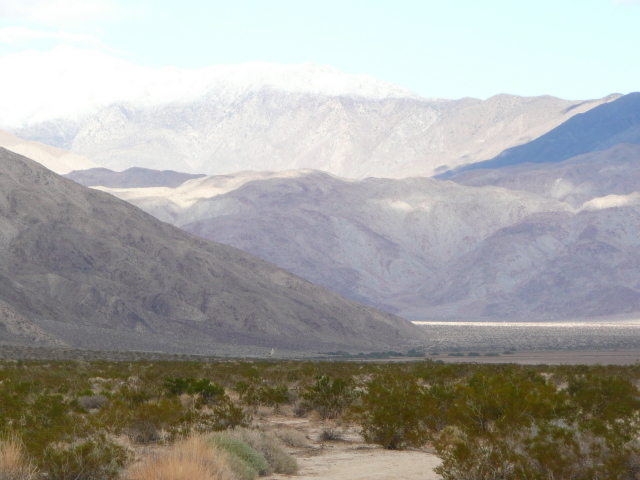 I pack up everything and tow the BLT toward Salton City. We pull into the ARCO plaza and I fill up the gas tank for $75 ($3.39 a gallon). Next I swing around back, past where the big trucks and motorhomes get their diesel. I park at the drinking water spigot, and pull out the fresh water hose from the back of the PTV. The wind is really whipping across the large, paved parking lot. Once the tank is filled, I drive over near the store and park next to the water vending machine. As I fill up eight one-gallon jugs ($.20 each), I hear “Excuse me. I like your rig.” A slim, dark-skinned man with grey hair looks admiringly at the BLT. “Thank you. I’m very happy with it.” We exchange first names, and Curtis explains his interest. “Sure. It has a stove, sink, and fridge. A bathroom with toilet, sink, and shower. ” A short chat follows about price and how he could cut costs by towing a small trailer. I wish him well and Curtis moves on. I park at the tank just as a man in a golf cart pulls up. He jumps out and commences to help me remove the tank cover. What a cheerful guy! I notice the name Jose on a tag on his shirt. I mention the cold wind and Jose puts a positive spin on it. “We get enough heat around here. It’s time for some cold!” I ask him if it’s windy a lot, and he says no. “You’re smart to prepare yourself for that, Jose.” His cellphone rings and he tells someone inside the store where to put the cases of water that were just delivered. “I’ve already been offered another job!” he reports proudly. “For more money, I hope,” I reply, smiling back at him. “Yeah! More money and benefits!” I marvel at Jose’s enthusiasm and good cheer. When he finishes filling the tank, he puts the cover back on for me. The cold wind still whips around us. “Gee, thanks, Jose. What great service!” He flashes a wide grin as if the most important thing in the world at that very moment is making sure I’m happy with the service at ARCO. No wonder he’s been offered another job. Off he goes in his golf cart, carrying my trash bags. Darn. Why didn’t I think to give him a tip? I go inside and pay $22.20 for 6.99 gallons of propane. I dump the tanks and start up the PTV to head for home. The crew sits on the bench seat, quietly waiting for what’s next. “You guys have been so good!” I guess they know they’re better off in the warm PTV than out in the wind. Driving back to the dispersed camping area, the sunny aura of Jose stays with me. He’s so full of hope for the future. I wonder what happened that put him “off track,” and what brought him to where he is now. What’s that phrase? A new lease on life. That’s what Jose has. A new lease on life. And I have it, too. This entry was posted in Simple living and tagged Anza Borrego, ARCO, Clark Dry Lake, dispersed camping, dump station, propane, RVing. Bookmark the permalink. Every day can be a new lease on life. Hi Rusty! Yes, I got my license back. I might have forgotten it, except the cashier told me she always makes sure people get their cards back. No, Bridget and Spike don’t have sweaters. If they did, they’d make me stay out in the cold with them! Great entry today! You have great adventures doing the every day chores that come with camping! Cathie in Oklahoma where the wind……….you get the picture. do you fill the BLT with water also. I read a post where you had a water tank in the PTV, do you fill that too? I have read where some have portable grey/black tanks to extend stays, is that practical? I will have a casita also so am looking at the ways you extend the capacity of the tanks. Great pics too! I am currently in the Mtns of Oregon, snow and 14 degrees. Yes, as I wrote in this post about the drinking water spigot… That’s when I put water in the BLT’s fresh water tank. I don’t have any large tanks in the PTV. I prefer to use one-gallon jugs. They are an easy weight when full. I usually have one on the floor by the crew’s water dish and one or two outside the door. When empty I exchange for a full one out of the PTV. Very manageable! The best jugs are from Arizona tea. The plastic is rugged, the caps screw on, and the handle is strong. Maybe someday I’ll want portable grey/black tanks if I decide to stay in one place for several weeks. I move around enough now that I don’t need that. Yikes… snow and 14 degrees… And it was so nice when we were there! We left Oklahoma mid morning, but did not leave the wind behind for some time! The fur kids hated the wind, therefore they took even longer to do their “duties” Thank goodness we are in less windy Texas and heading south…then New Mexico, here we come! Watch out for New Mexico wind and blizzards… I got caught in one of those the week after Thanksgiving 2011. Sue, I wonder if your Casita is bothered by the wind? Does it shake and worry you at all? I love to hear your stories… each time I open your blog, I get a smile on my heart! Hi Barb… The Casita will rock like a hammock in strong winds which doesn’t bother at all. I find it soothing. I’m pleased my blog makes your heart happy. Oh Sue! I am glad you aren’t bothered by the wind… My little 15 footer I had (vintage Aladdin, probably not as well balanced) did some ‘tire hopping’ at one point, and it made me concerned for you out there in the open. Well, if the winds are strong enough, we’ll be in trouble, but nothing can be done about that! Brrr……nothing like cold and wind! Good for Jose!! Some folks are stuck in their day to day lives and don’t prepare for the future. You probably made his day….by taking the time to have a conversation with him and thanking him for his service. That in itself is priceless. I am a little late with this comment for the discussion but thought I would add it to today. Rather than a Crock Pot use a Thermal Cooker which I think one Commentor was calling a vacuum cooker. I have been using mine for over a year now and wouldn’t be without it. I think your reply regarding you making a list of all your camp sites and directions to them was far more civil than mine might have been. Your a nice person, don’t let wannabes take advantage of you; they need to do some of their own work. I agree with Ed. I wanted to say something earlier but didn’t want another nasty thread to start. If you can’t do some homework to find places to stay on your own, then you don’t need to go dry camping on your own. Buy a map. It did cross my mind that maybe I’d be helping too much. Anyway… part of the fun of this vagabond living is finding your own way. Ed, About the thermal cooker . . . I take it you’ve not experienced the problem mentioned regarding attaining proper temperature for food safety. I’ll take a look at them. What ever you are cooking is brought to a boil before the inner pot is placed in the Cooker so I can not see how that is NOT attaining a safe temperature. I have let meals ‘cook’ for 6-8 hours and when served they were still close to steaming hot. That is the idea, slow cooking just like a crock pot only with limited power needs. I see. The boiling part is crucial. Maybe people skipped that part and hence the problem. You’ve got me interested in this thing, Ed. It was a pleasure to hear about Jose. After the horrible event in CT yesterday, it’s nice to hear about someone who was super nice, positive in their demeanor and is looking forward to living his life. It gives one some faith in humanity. Thank you for posting. You’re welcome, Donna. What a horrible situation. I was not aware of the tragedy when I wrote this post. Sue, I really enjoyed today’s blog and I am happy for Jose. It is an oasis in my day to share your day, so ordinary, so real and yet very exciting. Hi Allen . . . I can take ordinary to a whole new level…LOL Thanks for writing. Very nice report Sue, thank you. Did you know you can stay overnite at the Casino (free) just up the road from that station? As info! No, I didn’t know that, Jack. That would be a good place for anyone passing through the area and needing a place to stop for the night. Thank you. Glad you liked the post. It’s nice to run into positive people like Jose. Wish more people could see the glass half full instead of half empty. But maybe he doesn’t know that he only has a little TIME left before it all runs out on December 21, 2012. My RV park is having an End of Time party on 12-21-12 hows that for positive thinking ha. Kind of like a hurricane party? Sounds like a rocking RV park . . . Your kindness and interest in his story probably meant more to Jose than a couple of dollars. He sounds like a real ambassador for any service oriented business. It’s been cool and wet here in the AZ desert area and mucho snow in our mountains. I am spoiled and get kinda blue when I don’t see sun for a few days. Where we going next Sue? I’m spoiled, too, Jim. I’ve gone for months with nothing but beautiful weather. A little wind, rain, and cold — in December — for crying out loud, and I’m put out. Ha! Where are we going next? Funny. In the summer I’m told to slow down. In the winter I’m urged to move. To answer your question… no plan yet. Tell me about it Sue, I had three gloomy days and I got blue. I live on sun. Even on summers hottest days I can be out early and as I enjoy the indoors with my central air, I can look out and see good ole sol. I buy baby sweaters at Goodwill for my pups…they fit perfect. Dog sweaters are so expensive….a friend clued me in on buy baby sweaters…every inexpensive at second hand store. I also buy fleece baby blankets for pups to line crate or on car seats. Excellent idea, Rita! I’m curious what size dogs you have. You probably told me once . . .
Hi Sue, I was wondering the many times you boon dock, in the desert. When you find a spot to set up camp . Have you ever gotten stuck in the sand ? And what would your plan be if that ever happens . Being way out in the middle of no where by yourself… Cheers Dominick from Rochester, NY. No I’ve never gotten stuck in the sand. What would I do? I’d dig a deep trench, lay down boards that I keep in the PTV or stones or anything else that might give some traction like a floor mat.. I’d let the air out of the tire(s) down to around 10-15 psi. I’d rock the PTV back and forth (reverse/drive) gently. If I couldn’t get out by myself, I’d call my emergency road service. No cell service? I’d put up my antenna and email my sister in Mississippi and ask her to phone my emergency road service. No internet? I’d walk to where there is cell service. If the BLT is stuck and not the PTV, I could unhitch and drive to where I could call. Or I’d go into the BLT, make myself a bowl of soup, get out a camp chair, have lunch, and,after a time, dig some more. WOW ! Sounds like you have a few good plans . thanks for the information.. I learned something new about letting the air out of the tires. Never would have thought about that. Lovely that Jose was so helpful and cheerful to you!! I worked retail years ago for a couple years. Sometimes people would apologize that I had to do something or other for them…I always told them that it did not matter what I was doing because the pay was the same and I had to be there for those hours anyway so it was fine with me. Glad Jose is already seeing his good attitude pay off. This attitude of entitlement that is so prevelant today is so detrimental to our society as a whole. Refreshing to find some out there who are doing their best and with a good spirit too!! People working any kind of customer service can make a day brighter or make a day gloomy for those they meet. I know a woman in a small town whose job it is to pump propane, along with other duties. She’s the only propane in town. I’ve gone there three times and each time she has darkened my day. She treats customers with contempt. . . . eye-rolling, muttering under her breath, sighing. I used to teach kids like her… same behavior. Maybe if she had a different attitude, she’d be offered a better job, like Jose. Certainly would be doing the world a favor. You’re welcome. I love meeting “ordinary” people with extraordinary character. Probably because the good ones get offered better-paying jobs elsewhere. I love your interaction with Jose! One person like that can really brighten an entire day. Of course, it works both ways. Several years ago, I dropped in at the local department store a few days before Christmas. The saleswoman was really overworked, naturally. When she handed me my bag, I smiled, thanked her, and wished her a merry Christmas. Her eyes filled with tears and she said, “That’s the nicest thing anybody has said here all week!” Made me think her other customers should be sent back to kindergarten. They obviously hadn’t learned about playing well with others. I suspect your behavior brightened Jose’s day as much as his brightened yours, Sue. Great reminder for us all, Louise, especially at this time of year. I’ve been trying to research how your internet works. Just a quick question–Does your mifi work independently or does it somehow work through your phone? It’s all just beyond my ken. The solar thing is not as confusing for me, but I seem to go around in circles with the internet thing. Thanks, Sue. I do appreciate that. I love it…the pictures you show us..both visually and in your writing…the people you meet…your thoughts for the day…I love it! Jose sounds like a great fella. If only his attitude and outlook were the most common among us. Same to you, Wayne, and to yours.